A marketing strategy establishes your goals to promote your business and helps you create the blueprint to help achieve those goals. Developing a marketing strategy will help you identify the strengths and weaknesses of your therapy business with a view to successfully marketing to your ideal client. Your marketing strategy provides you with the opportunity to communicate the benefits of your therapy business to your target market. Establishing a marketing strategy gives you control over the message you wish to convey about your business. A marketing strategy also allows you more control over the necessary monetary and personal time investment that is required in marketing your business. Before developing your marketing strategy you should have a clear understanding of your business goals. These business goals can include anything you wish to achieve in your business on a financial, professional and personal level. Who is my ideal customer/client? The types of products you wish to create that would benefit your client. What is something you notice in therapy that your clients could use outside of therapy to help them? Once you’ve established these main goals you can begin to develop a marketing strategy that will support the execution of these goals. Use this table as a guideline to define your business goals. Remember when you are creating your business goals that you should focus on the skills and expertise that you can offer potential clients. Now that you’ve established your main business goals you can analyze each goal and develop a strategy that will help support those goals. It is easy to get overwhelmed at this stage in trying to develop a clear strategy. You might think you need to try every possible idea that you have. The best approach, however, is to keep a clear vision of who your client is and what they need to help address their problem. Psychological services have a unique position with regard to marketing services and products. The marketing must be done ethically with the understanding your potential client is in a vulnerable position. You may belong to a professional organization that provides guidelines and regulations around advertising for your services, therefore you should check your marketing meets with their guidelines. In addition to professional organisations, you may be regulated by government requirements on how you market your services. In Australia, the Australian Competition and Consumer Commission (ACCC) and the Therapeutic Goods Administration (TGA) regulate the advertising of health products and services. Your country will have its own regulatory bodies. To establish a marketing strategy we’ve created a table below using the four core business goals previously mentioned. 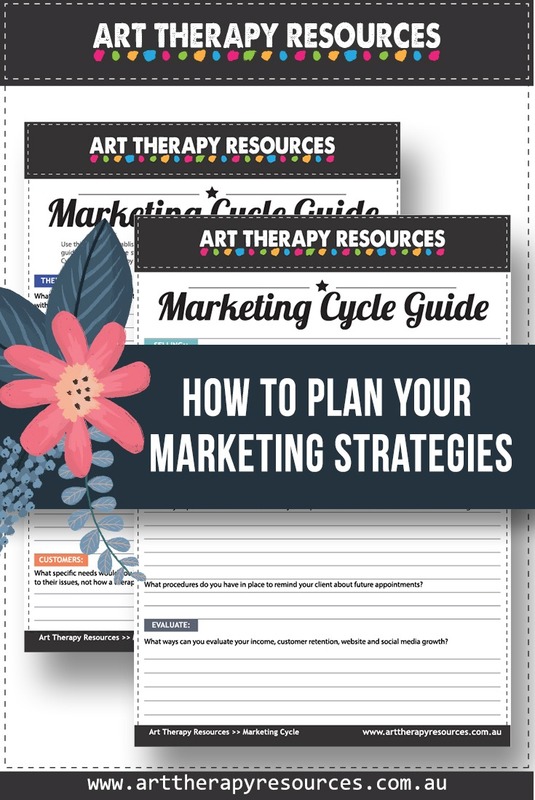 Now that you’ve defined your core groups, your marketing strategy should focus on where you would find opportunities to expose your art therapy practice name to these different clients. These opportunities should include both offline and online opportunities. Offline opportunities usually include referrals and using professional networks. Online opportunities can also include referrals and professional networks as well as using social media platforms. 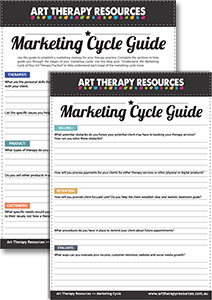 Using the previously mentioned business goals, your marketing plan will be similar to the art therapy services provided to women, children and grief support groups. Your marketing should include your specific skills and the services you offer at your practice including types of payment, operating hours and access to your practice. These are all important considerations for potential clients. When marketing your services to organisations who facilitate conferences, your marketing strategy will be based on marketing your professional skills, expertise and accomplishments. Your marketing strategy will be based on direct contact with specific organisations. If you have limited time and financial resources, you should aim to focus on the service that will deliver you the most income. Once you are confident you have implemented an effective marketing plan for the highest income stream, you can then focus on the second highest income stream and so on. It is important to constantly assess the effectiveness of your plan based on the response to your marketing and make changes where necessary in your advertising material and your marketing platforms. You should also remain flexible with your goals and plan. For example, in the business goals previously mentioned, it’s possible another art therapy service in your area starts to offer sessions for grief support groups. If this starts to impact your support group service, you can change your service to individual sessions or include additional materials or benefits for groups. Your marketing strategy should always be adapting to the changing environment to ensure your services stay relevant to what potential clients need.